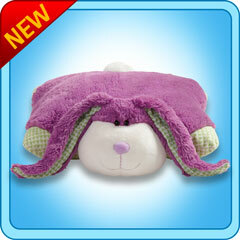 Home > PillowPets 18" > Fluffy Bunny 18"
My Pillow Pet Purple Fluffy Bunny Toy - Size: large 18"
The next great pillow pet in the My Pillow Pets Bunny Collection would be the My Pillow Pets Purple Fluffy Bunny, also know as the My Pillow Pets Purple Bunny. 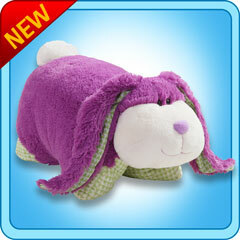 As that second name implies, this bunny is purple with long ears, and a great multicolored cloth patch under those large ears. This very fun toy, or pillow depending on how you are using it at the time, is very popular with children.